Make your own way to the meeting point, close to the Eiffel Tower, to meet your guide and small group of up to 18 people in time for an 8:30am departure time. Traveling aboard an air-conditioned minibus, relax on the around 1-hour journey to Giverny. Start by visiting the former home of Claude Monet and learn more about the Impressionist master as you stroll the beautiful gardens, known for their pretty flowerbeds, lily ponds, and Japanese-style bridge. Next, stop for lunch (included) at the Moulin de Fourges restaurant, set on the banks of the Epte River, before continuing to Versailles. Spend the afternoon exploring the magnificent Versailles Palace, starting with a guided tour of rooms such as Louis XIV’s suite and the Hall of Mirrors. Then, stroll around the beautiful gardens, and watch the famous Musical Fountain Show (every weekend from April to October). Finally, return to Paris, where your tour ends back at the original departure point around 5:30pm. Unfortunately, we are unable to accommodate guests with wheelchairs or any impairments requiring special assistance. Though the access to the castle is a priority access with a time reserved, you may still have to wait on arrival, especially during peak season, period during which there is a lot of visitors. Clients must be at the meeting point 15 minutes before departure. Guests arriving after departure cannot be accommodated, & there will be no refund if tour is missed. Our tour guide was amazing, full of knowledge and helpful tips about Paris. Giverny was amazing and it was nice to be able to walk the gardens at our own pace. Versailles was incredibly crowded but our guide did a great job of getting us through, even giving us access to rooms not usually on tour. Wanted to see both Giverny and Versailles but didn't want to do 2 more separate day trips, decided to go with a group tour to manage the logistics rather than on our own which we did to Fontainebleau and worked out beautifully, only 5 people in our group. Our driver/guide, Michelle, was a wealth of knowledge, very helpful and kept to a good time schedule which did not feel rushed at all but got us back exactly when they said they would. She was also very accommodating in dropping us off where we wanted. I would ask for her again next time we go and take the kids loved it! I loved this tour it was perfect! Super informative and the only way to get through Versailles without waiting and before noon! Which is epic. Being driven there going straight in and given a guided tour throughout it. Some people wait hours and are lost in the lines. I loved Giverny. My only regret is not having cash on me to tip my guide. She was excellent nice British guide. A Five Star Value: Our tour included an in-depth view of Claude Monet's Gardens at Giverny, a fabulous four course luncheon at the historic Mill at Le Moulin de Fougeres, and an afternoon tour of the most significant architectural and historical aspects of Versailles and Gardens. Our guide, Mr. Silva, was charming, an expert in all aspects of the tour, invited and answered all of our questions, and expedited our entry to all locations. The minibus we traveled in was comfortable and, so, the day was a delight and a great value given all we did. 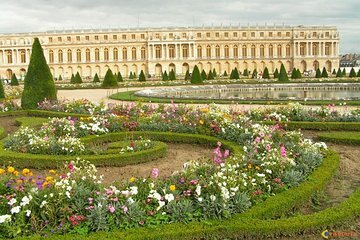 I wish the stay in Versailles was longer. than in Giverny. There was more to see in such a short period of time. Our lunch was in a very beautiful setting out in the country and the food was delicious. very well planned out and relaxed. This tour was well worth booking - it was a perfect balance of Giverney to Versailles with the most delightful and entertaining delivery of succinct knowledge and history from our guide Nabilia. She was so good we are hoping to request her for another tour. If you want to experience the best of both of these places I seriously recommend this tour as it is small, informative but allows you freedom - thank you Nabilia and Viator!! Versailles although amazing was way too crowded to enjoy. Our guide was very knowledgeable. This tour was amazing! The day began at Giverny Monet's home and gardens. If you appreciate Monet's art, you will love this tour as you can clearly see where he got his inspiration! This was followed with a wonderful lunch at a small countryside converted mill. The food was incredible and the people were very kind and friendly. We ended the day at Versailles which was great - I learned much but still preferred Giverny. We had one tour guide for most of the day and his colleague gave us the tour of Versailles. Both tour guides were wonderful - very knowledgeable. I truly enjoyed this tour and would love to go again!! !